1. Cook the vanpayar adding enough water in a pressure cooker for 4 – 5 whistles or until soft and done (do not overcook). Drain excess water and reserve. 2. Meanwhile crush garlic, shallots and cumin seeds in a mortar and pestle. Combine the crushed mixture with grated coconut, turmeric powder, chilly powder and combine everything with your hands (njeruduka). 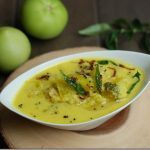 Add this coconut mixture and some curry leaves into the center of the cooked vanpayar and cover it with some of the cooked vanpayar. Sprinkle 1 – 2 tbsp reserved water, if it looks very dry. Cover with a lid and allow to cook for a few minutes over very low heat. Open the lid and mix everything well. Cook for a minute. Add a tbsp of coconut oil. Taste check for salt. Mix well. Serve hot with rice / kanji.